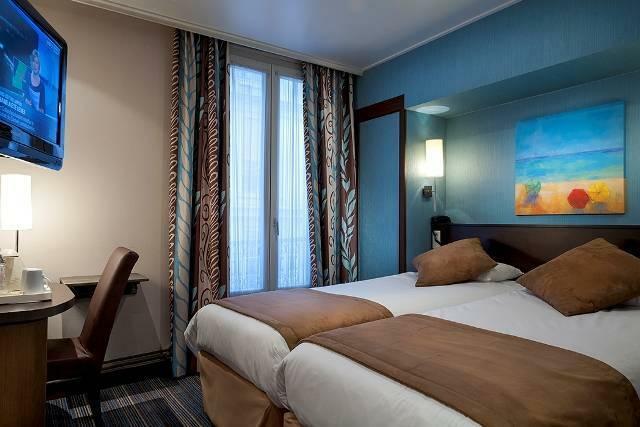 ﻿ Timhotel Odessa Montparnasse Paris. JIMAT di Agoda.com! Ada soalan mengenai Timhotel Odessa Montparnasse? Terletak di tengah-tengah 14th - Tour Montparnasse, Timhotel Odessa Montparnasse merupakan tempat yang sesuai untuk meneroka Paris. Terletak 1.5 km dari keseronokan bandar, hotel 3-bintang ini terletak di lokasi yang sangat baik dan menyediakan akses kepada tarikan terbesar di bandar. Dengan tarikan utama di bandar ini seperti Montparnasse, Montparnasse Market, Observatoire Panoramique de la Tour Montparnasse berada pada jarak yang dekat, pengunjung hotel pasti akan menyukai lokasinya. Timhotel Odessa Montparnasse menawarkan perkhidmatan yang sempurna dan semua kemudahan penting untuk menceriakan pelancong. Tetamu hotel boleh menikmati kemudahan seperti Wi-Fi percuma semua bilik, meja depan 24 jam, simpanan bagasi, Wi-Fi di tempat awam, tempat letak kereta. Hotel ini mempunyai 55 bilik yang sangat cantik, setiap bilik dilengkapi almari, karpet, televisyen skrin rata, internet wayarles, internet wayarles (percuma). Di samping itu, pihak hotel menawarkan aktiviti rekreasi untuk memastikan anda mempunyai perkara untuk dilakukan sepanjang penginapan anda. Apapun alasan anda untuk melawat Paris, Timhotel Odessa Montparnasse adalah tempat yang sempurna untuk percutian yang menyeronokkan dan menarik. Harap maklum perkhidmatan Bas Shuttle Air France disediakan untuk tetamu. Hubungi pihak hotel untuk maklumat lanjut. 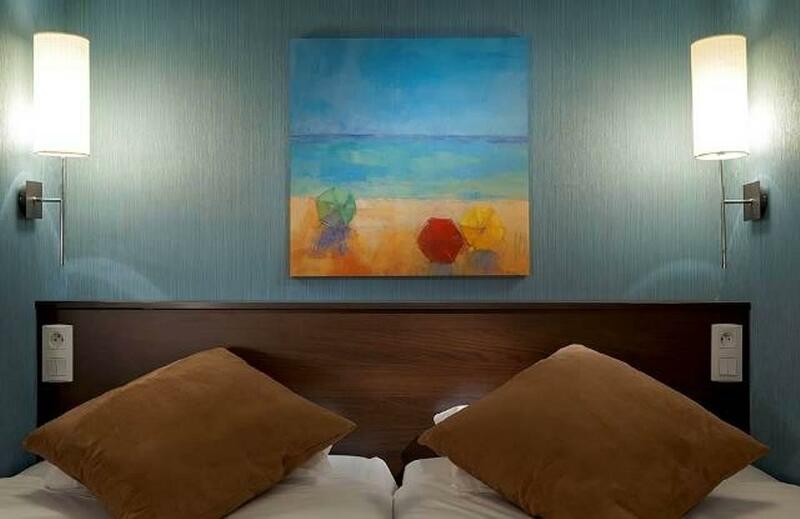 Location is great, just a hop away from great restaurants and transportation. Hotel itself is basic but adequate. If you want to travel to Our Lady of Lourdes You can get the train from Gare Montparnasse. Thats why i chose this hotel. Also you get shoping malls, super markets, Metro trains, Restauranrs, Clubs, and many more arround this property. Further it is very close by to major attraction in paris like Eiffle, Arc de triumph, Lourve Muciam, Norte dame, Luxmburge gardens,....etc. The TimHotel Odessa was undergoing repair for unexpected water damage, so They sent me to another TimHotel nearby. It is hard to have a comfortable hotel in such an old building. Cramped spaces, no lobby to speak of, tiny elevator. No Airconditioning and room was hot. I slept with window wide open. Otherwise the room was reasonably comfortable. 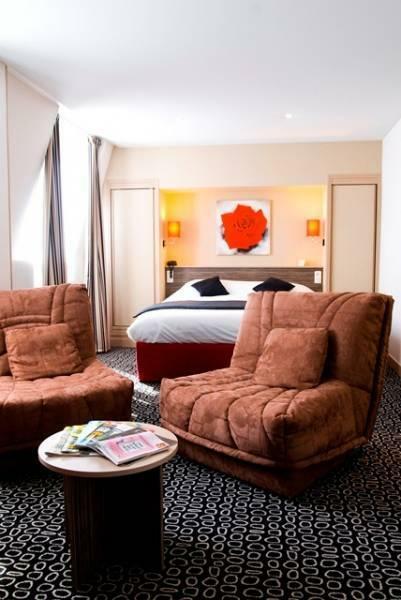 The Timhotel Gaite is located in the center of Montparnasse. The rooms are small but still ok and clean. The staff is friendly and helpful. The breakfast buffet is quite small and does not offer a broad viarity of food. As the hotel is located in the center of MOntparnasse access to public transport is very convenient. There is a broad viartity of diffent restaurants in walking distance. 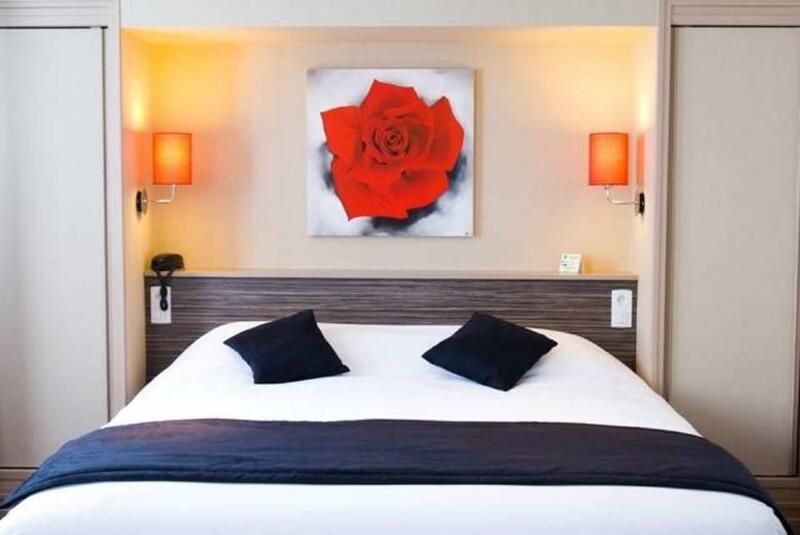 Excellent hotel location in a great Montparnasse street. Lots of cafes and restaurants in the area, as well as supermarkets. Easy metro access as well! I stayed to attend Roland Garros and found the commute to/from very easy to manage each day. Only negative would be the lack of mini-bar fridge in the room to store anything. Good location, very friendly staff. The problem is the room and the cleanliness of it. I will not recommend this, unless you will just stay to sleep - but on lower floors you can hear the noise on the streets. Location is good though, near Montparnasse Station. The location was absolutely brilliant. Walking distance to the Seine, Notre Dame, Luxembourg Gardens, Eiffel Tower (if you don't mind a twenty to thirty minute walk.) Close to the metro for longer distances like the Arc de Triomphe and Sacre Coeur. Our room was a little small but that didn't bother us. The best thing was the room was so quiet at night! Although our room faced the inner courtyard, I couldn't speak for rooms that don't. The area is really vibrant and full of shops, cafes, restaurants. We were really pleased with this hotel. Stay 5night at Paris, all Timhotel can cook hot water !! another 3 star hotel cant ! nearby many shop, cafe . The location is not at any one major attraction but is fairly central to the main ones. Great metro links from either end of the short street the hotel is on. 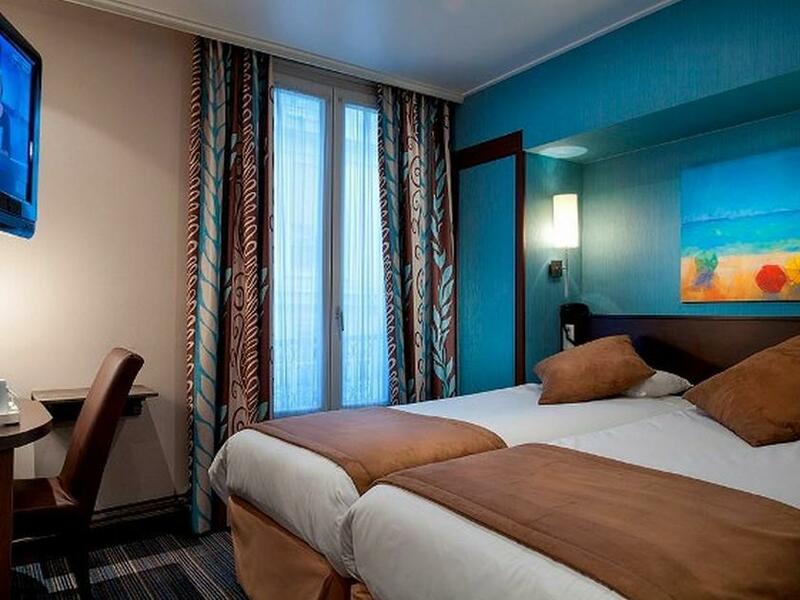 Rooms are as small, as expected for Paris. Rooms and the hotel in general were very clean. Staff helpfull. Would stay in this hotel again, primarily because of location. the room is quite small, but very comfortable. hotel staff are very helpful, they also arrange a van for us to the airport with great price. the location is perfect, very close to metro, just about a minute walk. many famous crepe restaurant around the hotel,as well as japaness restaurant. there is also c&a shop just a cross the hotel. great area to spend the night. Not annoying service, clean, towels refreshed daily. Very good location - close to metro, bus stations. Very easy to get to all the historical places, as well as to the Disney Land. Surrounded by many clubs, restaurants, cinemas. Hotel is good just for sleeping. many restaurants nearby and convenient. Staff are nice. perfect location. near 2 metro stations, some shopping areas, the area has several restaurants with different cuisines (french, Japanese, Indian, Chinese, thai). relatively comfortable. they gave free bottled water everyday in the room. receptionists were helpful. even printed our tickets to Versailles for free. they however forgot to clean our room once. good thing we dropped by in the afternoon. good thing it was cleaned by the time we got back in the evening. the location of this hotel is perfect. lots of nearby restaurants, near 2 metro stations, easy to shop and explore. hotel was clean and provided free bottled water everyday. however, there was a day they forgot to clean our room. good thing we got back in the afternoon to get some things so we saw. they cleaned it in time when we got back at night. they were also mice enough to print our Versailles tickets for free. location. threw in a free breakfast. location. 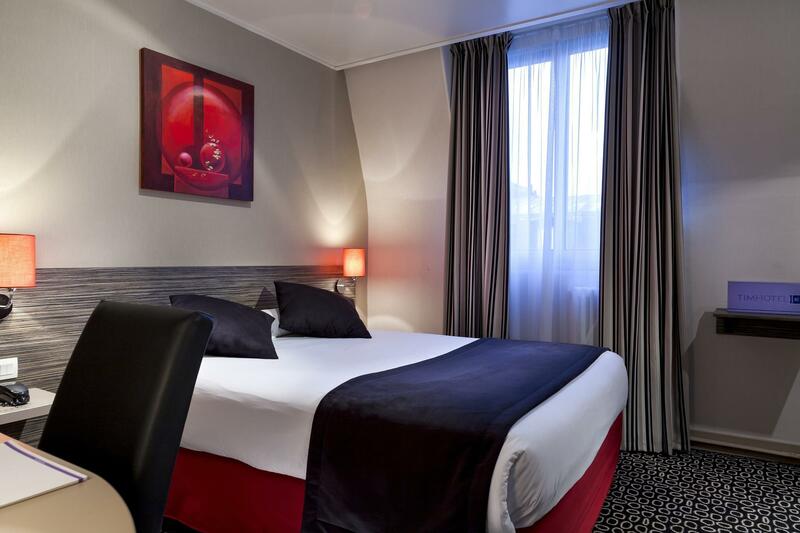 Nice enough hotel, located close to the shops and train station with lots of metro lines in close proximity. Very comfy babycot says the 2 year old. Friendly staff except the breakfast lady, -felt like we were in the way. Quite small hotel in a very good location. The rooms are very small but clean. breakfast was average. mainly the baquette (bread) were the end of the baquettes. It felt like eating the left overs of a sandwich shop. The eggs and other warm breakfast items were often low on stock. no fresh orange juice.